IMSL Software develops software for exchanging data between PCs and handheld digital devices such as electronic organizers, PDAs, and digital cameras. Trial versions of our end user software products are available for download from this site for a free evaluation. IMSL Software provides general information on Casio and Sharp electronic organizers on this site as a free service. IMSL Software is not affiliated with Casio Computer Co. or Sharp Electronics, so please contact those companies directly for warranty service or product support. For more information on IMSL Software's OEM products and design consulting services, see OEM Products and Services. 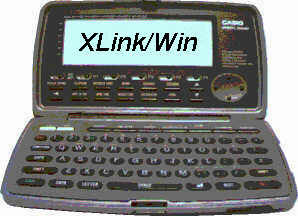 XLink/Win is a data backup and data exchange program for Windows which supports both Casio and Sharp electronic organizers. In addition to the Casio models supported by CASIF/Win, XLink/Win supports most Sharp YO/ZQ/EL/OZ/TM electronic organizer models and some additional Radio Shack and Oregon Scientific organizers. Data can be exchanged between any supported models. XLink/Win runs on any version of Windows, including Windows emulators for Mac and Unix systems. A trial version of XLink/Win can be downloaded free from this site. CASIF/Win has been the leading PC/Windows shareware communications and data management program for the Casio SF/CSF/NX (B.O.S.S.) series of Digital Diary organizers since 1994. All diary models, all Casio serial cables, and all versions of Windows on any PC or software emulator are supported. CASIF/Win also supports many Radio Shack EC models - contact IMSL Software to check on your model. XLink/Win has replaced CASIF/Win except for supported OEM versions. Casio is a registered trademark of Casio Computer Company Inc.
A minor update XLink/Win version 2.86 is available to fix the issue of long uploads encountering timeouts on the OZ/ZQ-7xx models as the organizer's indexing process slows down. XLink/Win is compatible with Windows 10, no configuration changes needed. A few new suppliers of Casio cables and parts have been added to the Cables page. It is getting very difficult to find alternative sources of supply for many of the old organizer cables, although usually it is still possible to make your own cable fairly easily. Unfortunately there are currently no known alternatives for the CE-139T cable for the older Sharp YO/ZQ models, other than finding one for sale second-hand. Our web site and email service suffered an interruption of 3 days from Aug 26-29. Service has been restored on a temporary host, but there may be a few more disruptions as we switch back. XLink/Win version 2.84 has been released for all users (see What's new in 2.84). This latest update is primarily for users of the Sharp OZ/ZQ Wizard models, particularly those supporting the User File data type. It runs on all 32-bit and 64-bit versions of Windows. XLink/Win version 2.8 has been tested with the final version of Windows 7 which Microsoft has released to manufacturing, and there are no known compatibility problems. XLink/Win version 2.8 has been released (see What's new in 2.8). This is a minor update, intended primarily to make the program more Vista-friendly. The default application folders are changed to comply with the Microsoft standards which are more rigorously enforced in Vista, and certain internal functions which caused unnecessary warnings from Vista's User Access Control have been altered to avoid the problem. In addition there are some new functions for more convenient import and export of files, and support for Microsoft Outlook format. If your PC does not have a traditional serial port, you will need a USB-serial adapter to connect a Sharp organizer cable. These devices plug into a standard USB connector, providing a tranditional serial port connector for external devices, and appearing as a virtual COM port in Windows. Usually they need to have a special driver installed, which comes with the adapter. However, not all USB-serial adapters work well with organizer cables. This USB-serial adapter is a common type which has been tested to work with XLink/Win and all Casio or Sharp cables. It works with WinXP, Win98, and MacOS, and it costs less than $5 delivered by mail order: http://www.dealextreme.com/details.dx/sku.5859 or http://ledshoppe.com/Product/com/CA4037.htm. This adapter is Vista-compatible. You may notice that our Message Board is now back in a new format, but it's starting off empty. Earlier this year we were having frequent problems with spammers posting on our Message Board, forcing us to halt access temporarily a few times. Unfortunately the last such incident broke the Message Board permanently, and former service host Ultraboard was no longer around to fix it. We have now reconstituted the Message Board as a YaBB board hosted on our own web server, which should give us a little more control. We can probably restore a few of the more helpful message board postings from our archives over the next few weeks, but unfortunately we can't re-create the former user registrations. Please re-register if you want to post new messages or receive alerts. Registered users of XLink/Win should check the Registered Users web page occasionally for program updates, especially if you encounter a problem which may already have been fixed by an update. If you are a registered user and you have forgotten how to access the Registered Users web page, please check your welcome email message from IMSL Software, or contact us for a reminder. Our web hosting service is in the middle of a server migration. If you don't get a response to your email to imslsoft.com, try imslsoft@gmail.com instead. Our oldest email address imsl@compuserve.com is now officially retired. Please replace with imsl@imslsoft.com . Our new web host is now up and running. If you encounter any problems, please send a note to admin@imslsoft.com and CC: imslsoft@gmail.com to let us know. Adds merge support for the YO-270 family and fixes some minor bugs in 2.7a. A new version 2.7a of XLink/Win has been released this week which adds support for the Sharp EL-6990, YO-270 (ZQ-270) and YO-290 (ZQ-290) organizer models. (Note that the OZ-290 or ZQ-290 Mark II model is not the same as the YO/ZQ-290 model - although they appear similar, they use a different communication protocol.) This version of XLink/Win also adds new support for reading fragmented memory backups from the EL-6790/6890, YO/ZQ-180/190/195/480/485, and YO/ZQ-150/170/470 models, and corrects a problem with the RLynx-YO cable. Casio has introduced some new SF models in Japan: the SF-4990 with 256 Kb of memory, the SF-6990 with 512 Kbytes of memory, and the SF-7990 with 1 Mbyte of memory. They look more-or-less like the SF-4985ER and support similar features, but use a new and different communication protocol which is not yet supported by XLink/Win. Looks like the SF model line is not finished yet. Casio has also finally published some of their SF manuals online in PDF format at http://world.casio.com/sf/download/en/manual/. Some updated information is available on the registered users web page for the OZ-7xx models. Also, new 2003 holiday files have been posted for download. XLink/Win 2.6a is now available for download. It includes some minor new features, several model-specific updates for Sharp organizers, and support for the Oregon Scientifc models. It is currently available in English and Portugese. New German and Slovak versions should be available before the end of the year. These data organizer models made for Radio Shack and Oregon Scientific by IDT are now supported by XLink/Win 2.6. These models have also been sold in other countries with model numbers PDB192, and MD4125. Microsoft has recently acquired Listbot and announced that they intend to close it down. Anyone who was registered with our Listbot mailing list should already have received a notice telling them how to go to our Message Board and re-register their email address to receive notification of postings to the News and Product Announcements section there. This will provide a service equivalent to the Listbot mailing list. http://amesdp.spymac.net. Our backup kits with the CE-139T cable for the older YO/ZQ/EL models are out of stock, and will not be restocked. XLink/Win shareware release 2.5e is now available for download. It includes several model-specific updates. XLink/Win release 2.5e is now also available in Portuguese, complete with a full translation of the Help file. November 15, 2000: What's happening with Casio SF digital diaries? Most models of Casio SF digital diaries have been gradually disappeared from store shelves and online retailers over the last few months. It seems that Casio has stopped producing all but a few models, and remaining supplies are now limited. Casio has not announced any official decision to end the SF model line, but they have been concentrating primarily on their PV and WinCE models lately, while Sharp has taken pretty much over the low-end electronic organizer market. In any case, XLink/Win will continue to support the full range of Casio and Sharp models. Casio has sold several million of the SF models since the mid 1980s, and people will certainly continue to use them for many years. We have added a new download site at http://imslsoft.webprovider.com since the server at http://imslsoft.webjump.com seems to be slow lately. The XLink/Win 2.5d release is now available for download. This update supports the latest Sharp OZ models. A new IMSL Software Message Board has been set up with sections for Casio diaries, Sharp organizers, and XLink/Win and CASIF/Win software. There's even a For Sale/Wanted section for those who want to buy or sell organizers and accessories. These sections of the message board are open for message posting by anyone. Official news and product announcements from IMSL Software will be posted to a separate restricted section. You can still send your technical support questions and receive answers by email, but if your question is of general interest it would be better to post it to the message board so that the question and answer will be available to everyone. Please support the message board! Read the News and Announcements section of the message board for more information. Those who prefer to receive email notification of updates can subscribe to receive an email whenever something new is posted to the News and Announcements section of the message board. We will continue send any important announcements to the current Listbot mailing list members. The latest version 2.5 of XLink/Win is now available for download. This version adds the ability to customize field names and form layouts. The Form Layout Editor is available separately to registered users. IMSL Software can now be found at http://www.imslsoft.com as well as http: //ourworld.compuserve.com/homepages/imsl. For the moment this domain address will be automatically redirected to Compuserve. The IMSL web pages have been hosted on Compuserve since 1994, and will continue to be hosted there, but please switch in any references or links you may have to the new address. Looking for the I.n.t.e.r.n.a.t.i.o.n.a.l M.a.t.h and S.t.a.t.i.s.t.i.c.s L.i.b.r.a.r.i.e.s?